Daniel Walker, an attorney for Wellness Connection of Maine, testifies during Tuesday’s hearing by the Marijuana Legalization Implementation Committee. State lawmakers overhauled the rewrite of Maine’s recreational pot law Wednesday, nixing drive-ups, internet sales and home delivery, and giving current residents and medical growers a “leg up” in the new market. 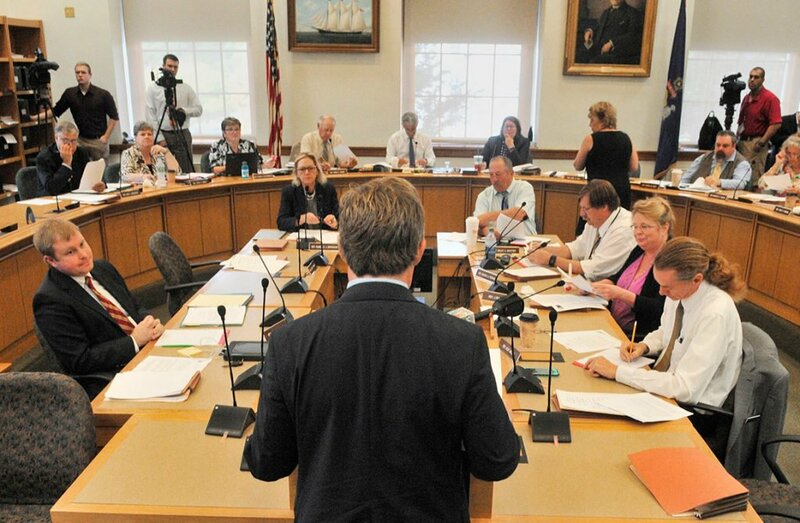 The legislative committee writing Maine’s adult-use market regulations made big changes one day after a dramatic five-hour public hearing on the 70-page draft bill, with more adjustments expected to come Thursday. • Drive-up sales, internet sales and home delivery were eliminated. • The residency requirement for recreational license applicants was increased from 6 months to 2 years. • Those who hold both medical marijuana and adult-use licenses will be allowed to commingle grows and production lines in shared space. • Dispensaries will not be allowed to convert from taxpaying nonprofits to for-profit status, which they said would help them compete and raise money. • Municipalities were given the authority to expand the 12-plant per-property limit for adults who want to grow pot for personal use to 18 plants. • Municipalities will be allowed to cut 1,000-foot buffer between recreational marijuana businesses and schools to 500 feet. • The plan to allow for a one-time transfer of medical plants into adult-use market was rejected despite criticism that would push back legal sales three to six months beyond start of licensing. The Marijuana Legalization Implementation Committee will return for a final work session Thursday to get a detailed financial review on the draft bill and tackle the remaining areas of concern, including the divisive issue of taxation. The committee had wanted to levy a 10 percent retail sales tax and the equivalent of a 10 percent excise tax. That would have worked out to be about twice what voters approved in last fall’s legalization referendum. The committee wanted half of its marijuana taxes to come from an excise tax that could be based on product weight rather than sales price, which is subject to fluctuation and makes it difficult for the state to project revenue. An excise tax also would make it easier for the state to share more of the tax proceeds with towns that host recreational marijuana businesses. The state has traditionally reserved the right to levy sales taxes. But setting an excise tax based on weight is complicated, and might involve setting marijuana prices, according to the discussion that dominated the committee’s morning debate. Committee co-chair Sen. Roger Katz, R-Augusta, said the panel wanted state help to do it, but the bureau of taxation refused. It’s not the first time the state ignored the panel’s request for help drafting the marijuana law. The committee began its day with a series of rapid-fire votes on a series of wide-ranging issues that had dominated much of the emotional testimony at Tuesday’s hearing on the draft bill. Internet, drive-up sales and home delivery of adult-use cannabis were quickly eliminated, Some members said these components of the bill made buying pot too easy. Others said they were too controversial. Supporters said many people will use recreational cannabis like an over-the-counter medicine, which many people buy at drive-up windows. And home delivery would at least keep consumers off the streets. Rep. Craig Hickman, an organic farmer from Winthrop, said many people might want to order online and have their marijuana delivered to avoid being spotted walking into a retail store. “The stigma around cannabis is absolutely stunning to me,” the Democrat said. The lawmakers spent a little more time debating how much of a competitive advantage to give to local residents and medical marijuana entrepreneurs who have proven themselves to be responsible. The draft bill had required a recreational license applicant to have lived in Maine for at least six months, but critics said six months wasn’t long enough to avoid an invasion by out-of-state carpetbaggers. The committee voted Wednesday to quadruple the residency licensing requirement to two years until June 2020, which is two years after Maine expects to award its first recreational licenses. “We want to give Mainers a leg up, initially,” said Rep. Lydia Blume, D-York. Lawmakers intended the residency requirement to be a concession to medical marijuana caregivers who had wanted a license preference when moving into adult-use sales. The citizen initiative had included a caregiver preference, but not a residency requirement. But lawmakers said a caregiver preference wasn’t necessary since recreational licenses are no longer limited. Critics worried the prolonged residency requirement was unconstitutional, and said that no other state license holder requires an applicant to reside in Maine. They also worried it would limit access to outside capital. But analysts said the draft bill’s fine print reveals that a licensed recreational marijuana business can still have outside investors, so long as they don’t make up more than half of its financial interests. The committee also voted to allow municipalities to reduce to 500 feet the current 1,000-foot buffer between adult-use marijuana businesses and schools that is included in the draft bill. The medical marijuana program in Maine requires only a 500-foot buffer, which means a bigger buffer might shut some existing medical marijuana caregivers or dispensaries out of the adult-use business. The personal grow debate consumed the committee before lunch. The draft bill had capped total personal grow at a dozen plants on a single parcel, but critics said it would hurt rural farmers and medical patients who grow their own pot. After extensive debate, the committee decided to keep the 12-plant, adult-use cap in place, but to extend municipalities the right to expand that limit to 18 plants on any one parcel. This would give rural areas flexibility. The committee took pains to point out that nothing in the new version of the draft bill would prevent every medical patient who lived on a shared piece of property from growing the six plants they are allotted. Supporters said this limit would discourage the diversion of excess grow into the black market. It was added to the bill at the suggestion of Colorado regulators, who warned them about the peril of large personal grows. Critics said the limit would hurt poor rural farmers who want to lease their property to a group of personal growers, especially on large pieces of property where larger grows would not affect neighbors. Hickman told committee members that he allowed three of his trusted friends to grow marijuana on his Winthrop farm, and that it would not be fair if the recreational pot rewrite would prevent him from doing that. There may be diversion going on in Colorado, Hickman said, but there is no proof of it here in Maine, he said. And lawmakers shouldn’t legislate based on the fear of the unknown.